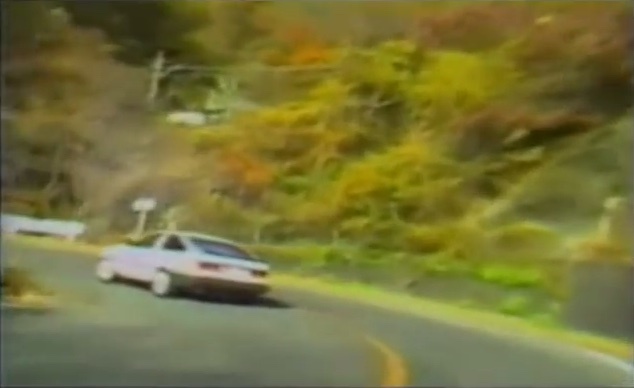 In this video Keiichi Tsuchiya drifts the Usui touge in his own zenki Toyota Corolla Levin AE86. Judging from the looks of the Levin the model is a GT-V Twin Cam 16 with a few modifications. This video inspired many young drivers to get into drifting and was basically the birth of the drift scene in Japan. Because of his key role in this video, Keiichi Tsuchiya got his racing license suspended. The verdict was “illegal street racing”. After his suspended license he always discouraged street racing, as seen in about every Shuto Trials (Shuto Kōsoku Toraiaru / 首都高速トライアル) movie.